We're getting closer to the end of Season 7, so let's take a look at the week 7 challenges! 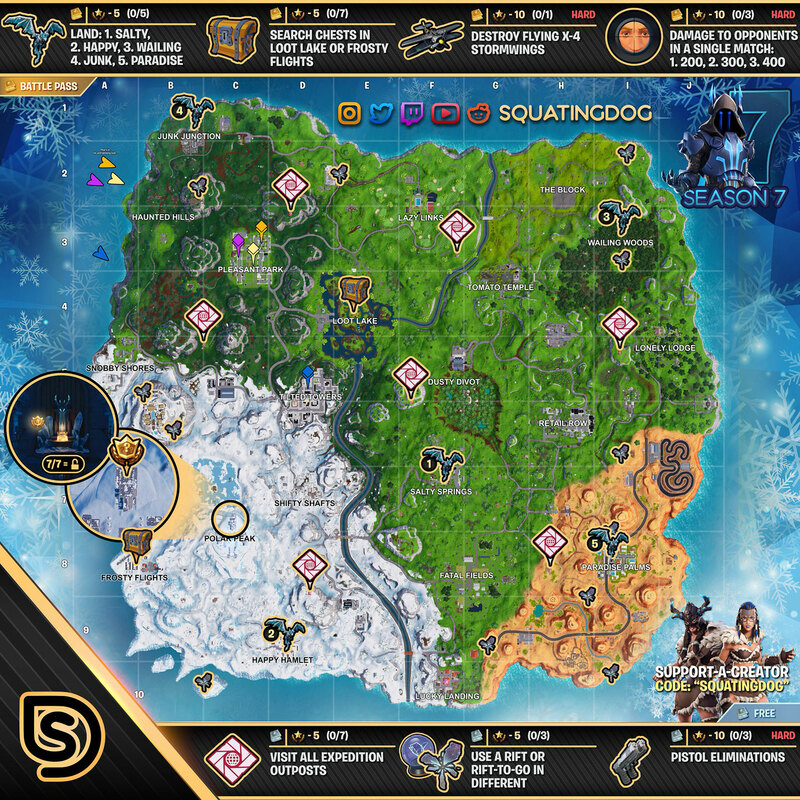 Our Fortnite Season 7 Week 7 Challenges List and Cheat Sheet brings you all of the solutions and answers for the challenges you need to complete for the week. We have maps to treasure and item locations, as well as tips for completing all of them as quickly as possible! This week we're visiting expedition outposts, using rifts or rift-to-gos in different matches, eliminating enemies with pistols, landing at various spots, looting chests at Loot Lake or Frosty Flights, destroying flying X-4 Stormwings, and dealing damage to opponents in a single match! 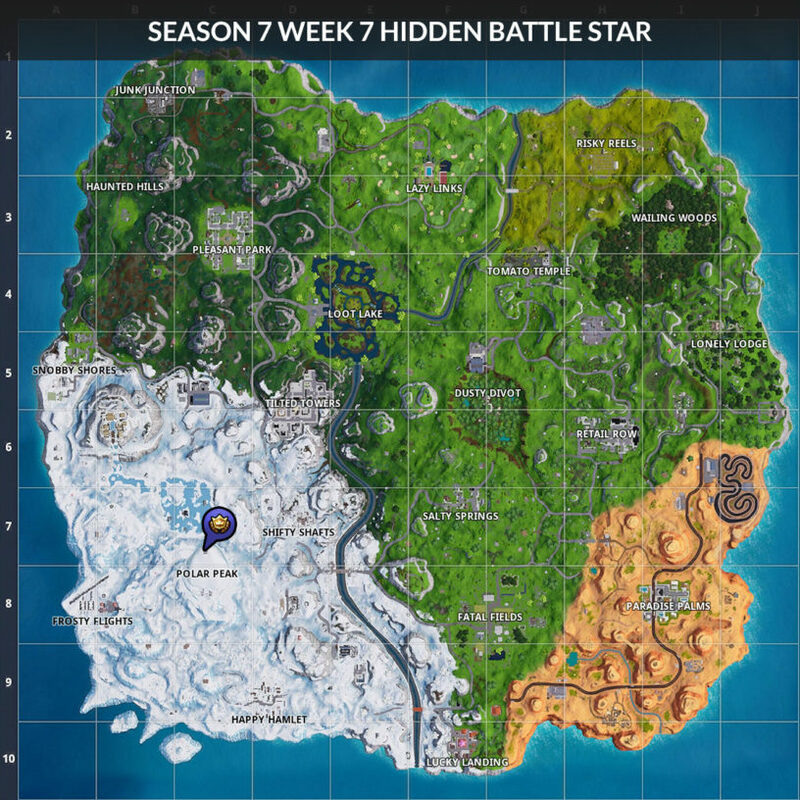 Check out our Fortnite Season 7 Guide for guides on every week of challenges, and you'll find all of the hidden stars on our Season 7 Secret Battle Star Locations Guide! The Expedition Outposts are all of those red tent like structures you'll see all over the map. These usually all have an airplane spawn at them, so grab a plane and head off to hit the locations. You can find them all in the cheat sheet. Rifts are still in the game?! They sure are, and you'll need to use them or find a rift-to-go for this challenge. There's still a great deal of rift spawns in the desert biome, but you can find more in the cheat sheet map. With the Hand Cannon being so good now, this might not be too difficult to do. You can also use that new Scoped Revolver that's pretty fun as a kind of sniper option in your loadout. This is a five stager, and it has you landing all over the map. First you start with Salty Springs and then you head off to Happy Hamlet, Wailing Woods, Junk Junction, and finally Paradise Palms. Unfortunately you can only do these one match at a time. Loot Lake is likely to be slightly less populated so you might want to head there if you are curious which one is the best option. However, the one that's furthest from the flight path is always going to be the better option. Remember that doing these in the LTM's is way easier. With the amount of planes flying around I don't think this will be too difficult. The only issue will be if you can get the last shot on the plane. If this becomes a real issue for you, it might be worth jumping into squads and having a friend fly a plane and jump out of it so you can shoot it down (this should hopefully work). This is a three stage quest and you star with 200 damage in a single match and then have to do 300 and 400. You could technically do this with one shot in every match if you find a heavy sniper rifle and hit a headshot! 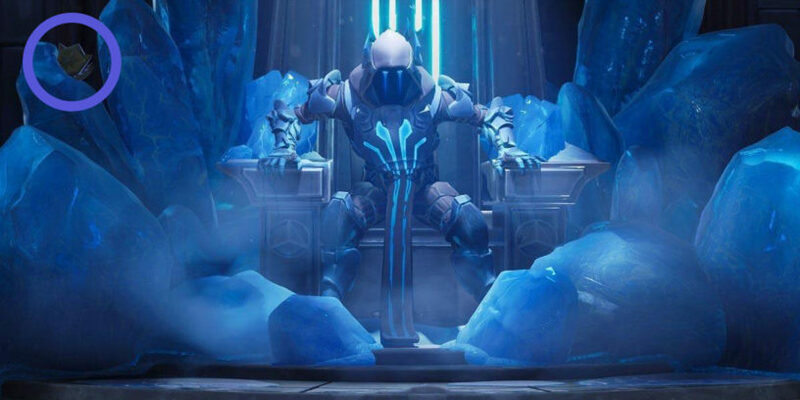 Once you complete all of the week 7 challenges you will get this awesome looking loading screen with The Ice King awakening from his throne. Over on the very left side you can see the transparent battle star that you need to locate. That star is inside the castle in Polar Peak. You'll need to go to the ground level floor and nab it off of the icy throne. The exact location is listed below on the map.